We got out riding over the Christmas holidays. 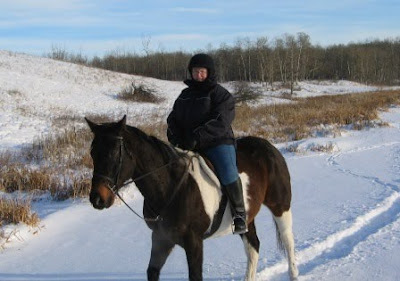 Here is my horse Jester and me. We are out on the edge of the little lake that is next to our property. We crossed the lake and rode on the neighbors hills, Sunny`s place, another quilter. We also took the dog with us. We got out riding four different days this holiday season. Hope we can get in a few more winter rides. I am sporting my new riding coat and my new half chaps that were my missing Christmas present, lost in the mail. I also have a new hat cover that covers my neck and ears. Great winter rides.